THE Bay City Rollers went out of fashion 40 years ago and by sheer coincidence that’s the average length of a wait in A&E these days (little bit of politics there). Put the two together and you’ve an unlikely coup de theatre on your hands. The Waterfront auditorium was packed, eager to see Handbag Positive, the latest work from A Night With George actress and co-scribe Donna O’Connor. This work was inspired after she fell during a performance and broke two fingers, which necessitated a lengthy – and obviously reflective – wait at the local A&E department. The set, designed by Niall Rea, could be any hospital waiting room – all hard seats, soul-destroying lighting, nothing in the way of decent refreshment. The time is passed by people-watching or people-avoiding, and the only blessed relief is a snatched 40 winks. Christina Nelson’s Attracta is there to visit her elderly mother who has every ailment going. She’s come prepared, has Attracta, bringing enough provisions for her and the entire hospital, it seems. As well as the voluminous flask and countless sandwiches, she’s got magazines and a blanket – she’s been here before, and often. 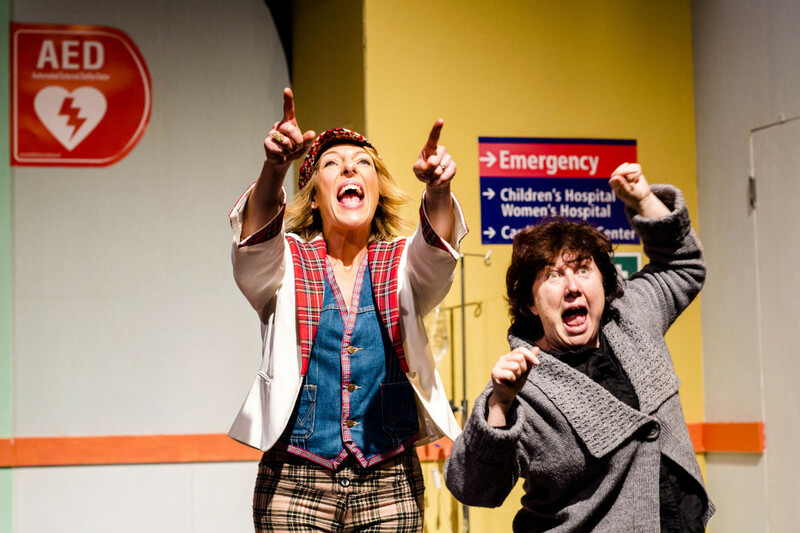 Enter Allie Ford’s Nora, there to see her mum too, sporting the Bay City Rollers tartan that she’s never managed to leave behind. They’re former school chums, these two middle-aged women, and an odd and rather splendid ad-hoc reunion gets under way. Both actresses are on top form, serving up a range of characters – themselves as teenage girls; a hard, embittered nun from school; their mothers when they were young(er) and healthy – to poignant, hilarious, foot-stomping and thought-provoking effect. Each scene has a blast of Rollers musical magic which had the audience clapping and cheering as if the band were right in front of them. The play references many relevant themes, from the state of the NHS, how the child eventually becomes the parent, failed marriage and unfulfilled dreams. But though life doesn’t always, or even often, turn out how you’d planned, there’s much to marvel at in the kind of resilience and human spirit that allows people to just get on with it – which is exactly what our two heroines do in the end. Seating is strictly optional as the audience were on their feet for much of the night – during the play in response to the joyous music, and at the end in a thoroughly deserved standing ovation.